Whether you are a long time Cricut user or a newbie around these parts, we are here to help you find the perfect Cricut Access subscription! Now, we realize some of you may have never even heard of Cricut Access -- so we are here to break it down for you. First things first. 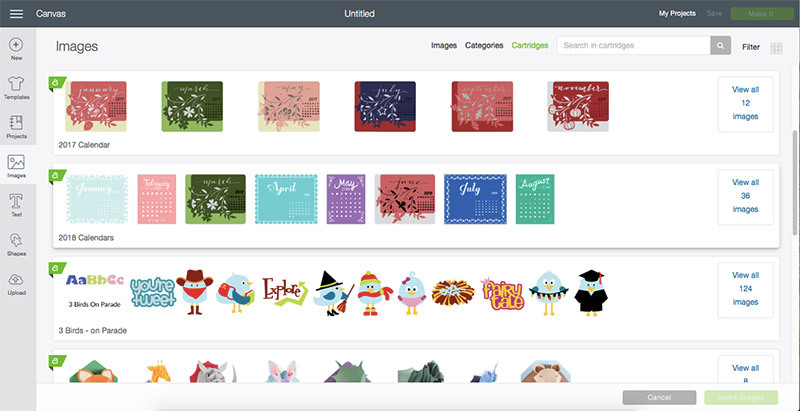 Cricut Access is a monthly or yearly subscription to the Cricut Image Library of over 30,000 non-licensed images, 1,000 projects, and 400+ fonts. You can also get savings on products, designs and shipping! There are three different plans available that you can view here. As you can see in the chart each tier has added benefits. Deciding which one fits your needs is entirely your preference. You can choose based on your crafting needs, but we love the 10% savings on all product purchases on cricut.com and 10% savings on licensed fonts, images, and ready-to-make projects with the Standard and Premium memberships! Plus, any tier you choose has a Priority Member Care phone line, which moves you up the list and gets your Cricut questions answered pronto! So What’s the Difference With the Cricut Access Tiers? The first subscription is for Cricut Access - Fonts. 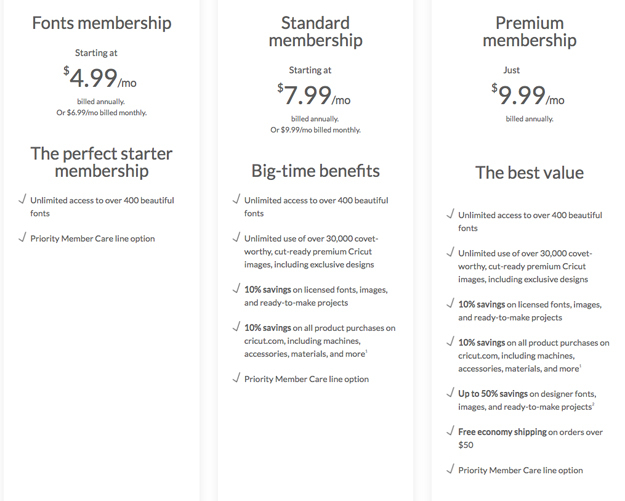 Cricut offers over 400 fonts, and this subscription costs as little as $4.99 per month when billed annually (in a lump sum) or $6.99 per month if billed monthly. The next tier is the Cricut Access - Standard. 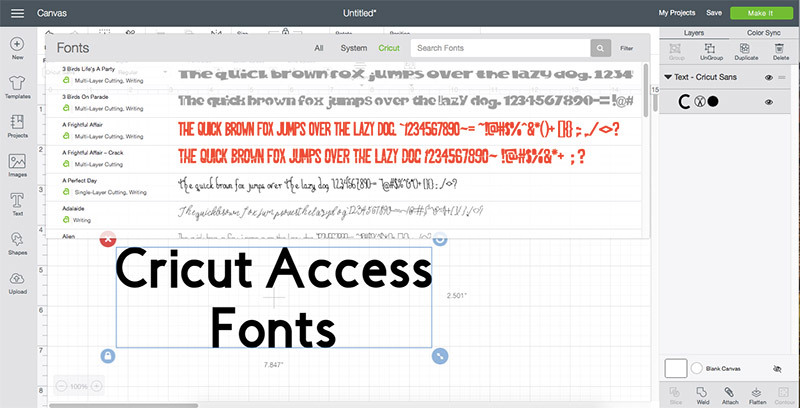 This subscription allows you to access 400+ fonts, as well as 30,000+ images and cut files. Additionally, this subscription offers a 10% discount on images and fonts not included in the subscription as well as on product purchases, with some exclusions. This subscription can also be billed monthly or annually. Standard memberships start at $7.99 per month billed annually or $9.99 per month billed monthly. Annual subscribers save $24 on this plan! And, wait … there’s more, Cricut Access - Premium subscribers also get free Economy shipping on orders over $50 on cricut.com. This subscription level has the most access and is the best overall deal. This is an annual-only purchase for just under $120. We love all the possibilities you are given access to with these subscriptions. We know you won’t be able to stop creating once you get going! If you are ready to dive into endless amounts of amazing designs and projects you can sign up for Cricut Access here. Just sign in with your Cricut ID! If you have more questions about what is included with Cricut Access, be sure to click here. * 50% off does not include images, fonts, or cartridges from Walt Disney Company® (Disney Consumer Products, Inc.), Sesame Workshop™, Sanrio Hello Kitty®, Boys Scouts of America®, Anna Griffin®, Lia Griffith™, Simplicity®, and Riley Blake Designs licensors. Discount cannot be combined with other discounts, including Cricut Circle, promotions, and promotion codes and cannot be used for in-app purchases. Cricut reserves the right to add or remove content and to otherwise modify this offer at any time in the sole discretion of Cricut. Which level of Cricut Access do you have? Let us know below! I just bought the new cricut machine. It would be nice if there was an explanation to some of the images like the 3d ones on how to make it after you print it. I’ve printed a few things but have no idea how to put it together. Once you decide on a project, scroll down. Usually there is Materials, Preparation, Cut, Assemble, then there is More Help and Images and Fonts Used in this Project. Click on the highlighted link next to “More Help” and it should take you to a tutorial on how to assemble your project. Once you decide on a project, scroll down. Usually there is Materials, Preparation, Cut, Assemble, then there is More Help and Images and Fonts Used in this Project. Click on the highlighted link next to “More Help” and it should take you to a tutorial on how to assemble your project. If clicking on the highlighted link next to “More Help” doesn’t help you, there are a bazillion tutorials on YouTube by independent Cricut enthusiasts that have navigated through the rough spots for those of just starting out. Is Cricut access available for Australian residents to purchase? I received the circuit Explore Air 2 for Christmas. I have Cricut Access Trial Membership. Not sure how to use it etc. I am trying to make a pop up card. when I got into it it says I have to purchase it?? Thought I would have free access. Hi. You can look for the projects and images that are included with Cricut Access by looking for the green A in the corner. You can also filter your search results to just show free or Access ones. I have been using Cricut Access Standard for the past month really like it. I got my new Cricut for Christmas. It would have been nice if it came with more information instead of leaving you with all the online searching. After I subscribed to Cricut Access and paid for it I found where I could have had free trial. Once you decide on a project, scroll down. Usually there is Materials, Preparation, Cut, Assemble, then there is More Help and Images and Fonts Used in this Project. Click on the highlighted link next to “More Help” and it should take you to a tutorial on how to assemble your project. If clicking on the highlighted link next to “More Help” doesn’t help you, there are a bazillion tutorials on YouTube by independent Cricut enthusiasts that have navigated through the rough spots for those just starting out. Love love love my cricut maker I started with the first one ever made and just upgraded every time a new one came out I have cricut access and I do get Frustrated with it sometimes.. I do a lot of my owe designs because some of yours are just to hard to figure out how to put your together. Hi I got a new Cricut maker for Christmas. I feel the Cricut access is too expensive especially for Canadians. I have signed up for the free month but I doubt I will sign up for further time due to expense. I have the Cricket Expression tried to use it once couldn’t get to work and back in the ?. Now there is so many machines out there and no way of paying the amount for the new Cricket. So question is that can I still use my machine instead of buying the one and use the internet too? Hi. The Expression uses the Cricut Craft Room software and unfortunately cannot be used with the internet-based Design Space. Hi. Contact us at cricut.com/chat and we can help you make sure that you are getting all of the images and fonts that you should be with your subscription. Got mine for christmas, wish I hadn’t! Tiny booklet of instructions! Many wasted hours and ruined projects.Hate it!!! I am sorry you are having trouble. I find that YouTube is especially helpful for learning. We have a channel and there are many other channels that explain how to use our products. I have had my Cricut Maker just before Christmas, have the Standard Access. Finding DS is a real learning curve. Interested in learning, when making a Card then having the Cricut Maker write the wording for inside the card, have been trying to do this for abit, has been quite challenging. Also I draw, would like to import my drawing into DS, then have it drawn by the Cricut Maker, this way I always have my original drawing. Hi. You can learn more about drawing/writing in this article. You would basically make sure to set the function to Write for all pertinent parts. I was disappointed to pay £280 to then have to pay a subscription to use some of the software? I agree about the expense. First, 250 for the Cricut. Then another 100 on the equipment and vinyll. Then I spent another 100 on the membership. An expensive hobby if you are not aware of what you should purchase. I do have to admit that it probably will be worth it. I have a Cricut Expression 2. Someone on another group said I should get this to use with it. It looks like the first level is just fonts. What type of images are in the standard access? I have another hobby that takes up a lot of my time & that I would rather do over anything, and I am just not sure that I want to spend the $$ for something that I am not going to get a lot out of. I don’t think I will ever be like a lot of people on here who use their cricuts every day. Thanks for any insight into cricut access. You can tell which images are part of Access by the green tag with an A in the corner. I have used almost every cricut – from the original baby bug, expression, explore 1&2 and now Maker. I have had the cricut access for 3 or 4 years now. I love it! I use it almost daily. I recently purchased a competitor (due to its capabilities to cut 10 ft at once) and after 4 hours of trying to figure out how to make it work, I’m returning it. The software was too confusing and couldn’t find enough videos to help. That being said, I have enjoyed the DS a lot. For those who cannot afford the expense – have no fear. The cricut is able to cut any font on your computer, as well (including ones you download) and images you download as well (I often purchase svg files from a 3rd party to cut on my cricut. Also, I pay for my subscription yearly in order to save even more $. I don’t use cricut vinyl – way too costly (sorry cricut) but instead use a diff vendor where 12×12 piece is only $1. When experimenting, I use the same piece of vinyl over and over so I don’t ruin good stuff. (Or practice with contact paper). Hope this helps y’all – it’s truky an awesome machine and the cricut access is worth it! When I first got my Cricut Air 2 I was at a complete loss and wished that I hadn’t purchased it. I started looking at the free Webinars that was offered and I learned so much plus I can go back and look at them over and over again. I still have much to learn but with the phone help and video’s I have really learned enough to get me by. I find the many free things which are offered at this time are suitable for me and will hold off on getting one of the accounts until I fully understand everything. I do find it rather expensive. Also, the manual is a great help. When I had a question or did not understand something I called the help line. Their patience is super good and will keep you on the line until you understand. They are GREAT. I have an original cricut machine. Is there a way to connect this to my laptop and use it with Cricut Access? Hi. Cricut Access can be used with the Explore series machines and the Cricut Maker.